Amazon has acknowledged a worsening counterfeit problem on its site and says it has made fighting the fake products a "major goal" for next year (via The Verge). Last month Apple filed a lawsuit against Mobile Star LLC which it accused of infringing upon its trademarks and copyrights by selling counterfeit power adapters and cables on Amazon. Apple claimed the fake products posed a risk to life, and said it had found that almost 90 percent of so-called genuine Apple products and accessories it purchased from Amazon over the last nine months were actually counterfeit. Following the lawsuit, Amazon said it had "zero tolerance for the sale of counterfeits" on its website and said it was working closely with manufacturers and brands to aggressively pursue the wrongdoers. Bloomberg reports that Amazon now says it plans to create a registry to prevent fakes and wants legitimate brands to register even if they don't plan on selling products on the site. Merchants then have to obtain official brand permission before they can sell goods from the company. Amazon has reportedly been experimenting with Nike and other brands to build the registry, but the company says it will target more brands in 2017 in an attempt to get them to sell their products on Amazon's marketplace. According to the report, Amazon tried to get the NFL and MLB to sell merchandise through its online marketplace, but the negotiations stalled because of a perceived lack of control over existing fake goods. I think the Marketplace cheapens the brand (and they are not the only people to do this). If I wanted cheap dodgy goods I'd use ebay. Long overdue, but great news. If Mobile Star would pay the license of their product to Apple would that make all their product MFi? Obviously Mobile Star is infringing the design and they need to pay their dues. Funny how Amazon didn't see a problem when Birkenstock pulled all product from Amazon due to fakes but as soon as Apple launches a suit, it's a different story completely. The reason why I brought that up because the functionality of the product that is copied works just like the original or an MFI product. Obviously Apple argues about safely but if this was licensed then it is now labeled as safe. 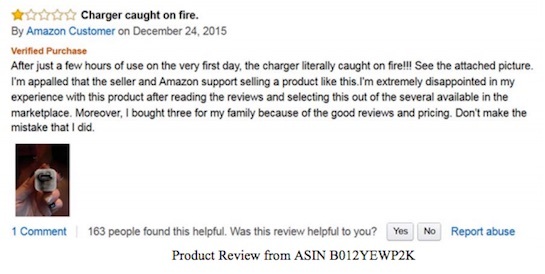 I know about issues being caught on fire but it did happen to Apple products or MFI licensed product as well. I know for sure that this company is blatantly counterfeiting the product. The problem is that the MobileStar chargers look just like the Apple chargers, but they skimp on the quality of the internals. From the outside, they look just like Apple chargers, plus they are listed as Apple OEM chargers. This is the definition of counterfeit. It's not like Anker with the mifi license. Anker stuff doesn't looke like Apple stuff. I agree with you 110%. Lots of other sites got into this crappy business as well, if I do a search on Best Buy's site or Newegg, often times I'll get dozens of pages of "marketplace" garbage. Much of it is discontinued products as well, I can't understand why a major brand would want their storefront littered with old, dodgy junk that they have no quality control over. eBay/Craigslist exist for a reason, we don't need a knockoff of them operating on every retailer's site. Amazon has a counterfeit problem. They can't be trusted. They should be able to list horrible third party accessories but should be honest about it. Shouldn't be able to say "Apple Official charger"
They should have done this years ago. Now they're looking like the jerks in the eyes of the customers, so they have to do something.